Vanpayar thoran recipe with coconut and spices is so popular in Kerala, South Indian as a side dish with rice or kanji (rice soup). You can learn here how to make vanpayar thoran with coconut easily in a pressure cooker as a one pot dish. See a more detailed slightly different version of Kerala style thoran recipe using vanpayar(red cowpeas) here, which is prepared with seasonings. The vanpayar thoran or red cowpea recipe with coconut (dry recipe) is also known as red payar thoran recipe, perum payar thoran recipe or simply payaru thoran recipe. Vanpayar thoran is simply cooked red cowpeas with coconut and spices which is a popular side dish enjoyed in South India, Kerala for lunch or dinner. The word payar means peas and red payar means red peas. 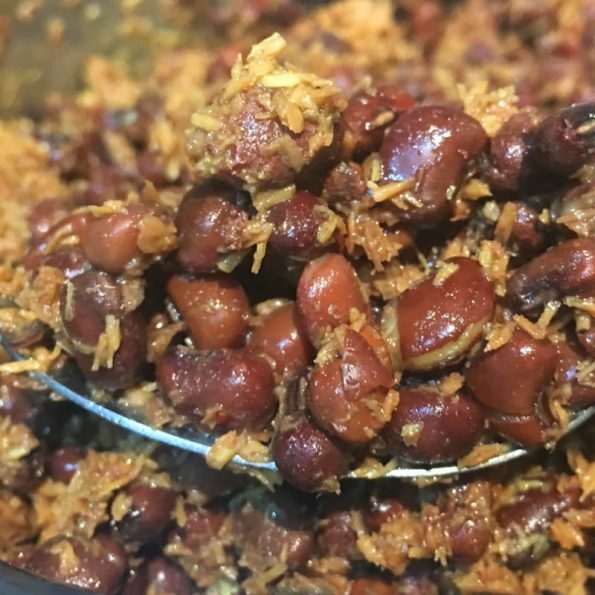 This protein rich red cowpea recipe is vegetarian as well as vegan recipe and it is an excellent side dish for rice or rice soup popular in Kerala, South India. The popular red peas used in Kerala is the red cow peas, although there are other varieties of red colored beans/peas popularly used in Indian cuisine (for example rajma beans which is different from red cowpeas). The word vanpayar is used to show this red peas is large in size compared to cherupayar (green mung bean or green gram). In fact this red cowpeas is not so large sized compared to many other peas varieties, however they are indeed large compared to the green grams or green mung beans. You can see red cowpeas in the picture below. The red cowpeas thoran recipe made using red cow peas, fresh coconut and spices is popularly served as a side dish in Kerala for lunch and dinner along with rice or kanji ( where kanji is rice with some water, which is kind of traditional rice soup). 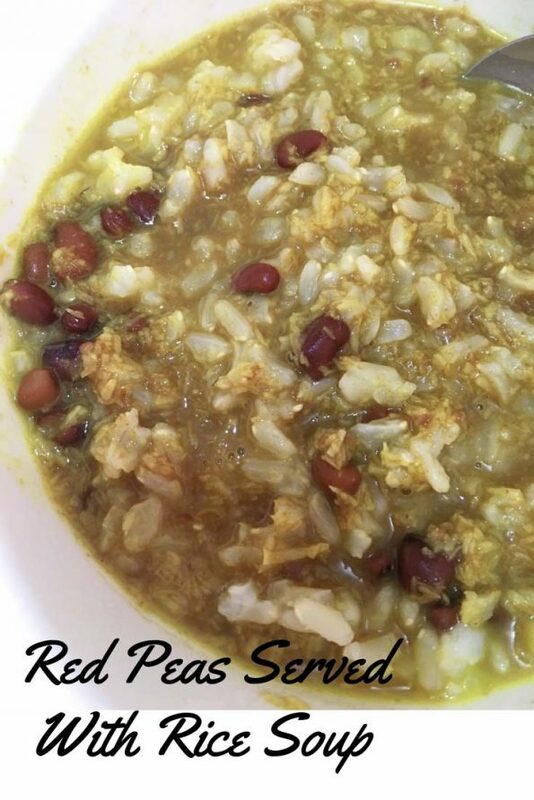 There are some other popular red cowpeas recipes where red cowpeas is also paired with other vegetables like pumpkins, green plantains or even tapioca. However here I am sharing the most simple vanpayar thoran recipe which is made using red cowpeas as the main ingredient along with freshly grated coconut and few spices. You can find a collection of all red cowpea recipes in this blog here. How To Make Easy Vanpayar Thoran? This vanpayar thoran recipe is a simple and easy one pot thoran recipe using pressure cooker method where we cook all ingredients in the pressure cooker itself. This is not the only way to make vanpayar thoran but this is a very simple and easy way to do it. 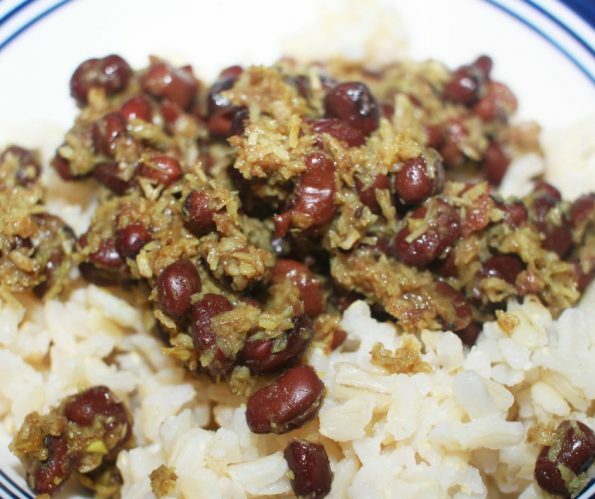 I also didn’t grind the coconut and spices for this recipe, in the traditional style, instead I added the grated coconut and spices to the cooked cowpeas directly to make it very easy. To make this vanpayar thoran without grinding the coconut or spices, you need to use finely grated or grind or shredded coconut or finely powdered coconut flakes and good quality spice powders. Vanpayar thoran recipe is made of red cow peas (red cowpeas legumes) also known as perum payar or van payar or simply red payar in malayalam language. So here is how I made this Kerala style vanpayar thoran recipe or red cowpeas recipe with coconut and spices. As I mentioned above, I used a pressure cooker to make the preparation easy, but you can also make vanpayar thoran recipe in a a pan or pot over the stove top. Making this red cowpeas is much easier if you use a pressure cooker, as it will reduce the cooking time significantly. 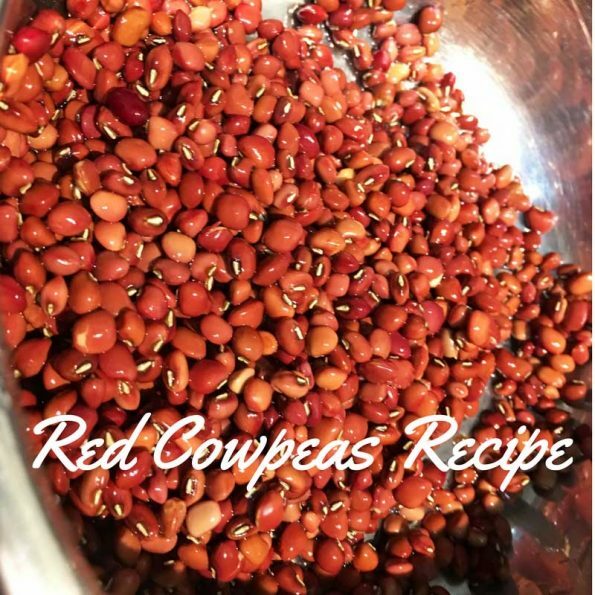 I will show you how to make this red cowpeas recipe using pressure cooker method here. If you are using a pan or pot to make the recipe, you just have to increase the cooking time as the peas will take more time to get cooked. In that case, you may have to add more water and cook until the peas is cooked softly. Just monitor the peas and cook until required if you are using a pot or pan, and add water as required so as to not burn at the bottom of the vessel. See here vanpayar curry recipe – red cowpeas curry recipe. So let us go on to see how to make vanpayar thoran recipe in pressure cooker as a one pot recipe. Vanpayar thoran or red cowpeas mixed with coconut and spices made using easy one pot pressure cooker method. Vanpayar thoran using red cowpeas, coconut and spices makes a yummy, easy side dish with rice or kanji (rice soup) in Kerala, South India. Soak the red cowpeas in water for about half an hour if possible, as this will improve the health benefits and make the cowpeas more soft. Remove the water used to soak the cowpeas and transfer the red cowpeas to the pressure cooker. Add 3 cups of water to the pressure cooker, mix everything well. Close the lid of the pressure cooker and cook in medium to high heat for about 12 minutes or until 3 whistles have come. (Make sure you are correctly following all the guidelines while using the pressure cooker including the use of safety valve, as these guidelines are important for the purpose of safety while using pressure cooker). After 12 minutes or 3 whistles, the red cowpeas should be cooked, you can switch of the stove and wait for the pressure cooker to cool off. Once the pressure cooker is cooled enough, open the lid and see if the peas is cooked completely. If there is excess water remaining, you can drain the water off or save the water as it makes a healthy broth for soups and stews. Add the finely grated coconut, garlic powder and remaining spices to the cooked cowpeas (vanpayar) in the pressure cooker and mix well and cook for another 2 minutes so everything gets well cooked and mixed. This method works well for me as the coconut I buy here is very finely grated. Instead of adding the grated coconut and spices directly, you can coarsely grind the grated coconut and spices (turmeric powder, red chili powder, garlic and cumin seeds powder) in a food processor and add this mixture to the cooked cowpeas (vanpayar) and make the thoran. The South Indian Kerala style vanpayar thoran or red cowpeas with coconut is ready to serve with rice or rice soup you wish. For best results, serve the cooked dish hot or warm with rice! This is an easy method to make the delicious red cowpeas recipe with coconut.Traditionally, you grind the grated coconut along with the spices and add this coconut paste to the red cowpeas (as I mentioned above). You can also add chopped shallots, sliced green chilies or crushed red chilies etc to make it more spicy and more flavorful!You may also add the grind coconut mixture to the pressure cooker early itself and cook everything together in the pressure cooker if you wish! In that case, you cannot drain the excess water, so you will have to heat the contents with the lid open for a few minutes until the remaining water is all evaporated. You may also make a Kerala style seasoning using coconut oil, mustard seeds, curry leaves and red chilies and add it to the vanpayar thoran, if you wish, to make it more yummy and flavorful! In the below picture, you can see vanpayar thoran mixed with kanji (ghanji or rice soup) a popular, simple and traditional dinner in Kerala style. This is healthy, simple and delicious as well. Hope you like the vanpayar thoran recipe or red cowpeas recipe which will help you to make vanpayar thoran with coconut and spices in Kerala style!